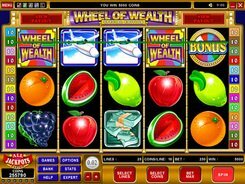 Wheel of Wealth is a classic 3-reel slot with a single win line and a wheel of fortune type bonus game. 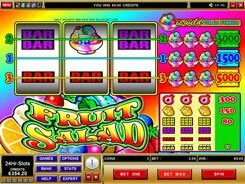 Betting options are fairly simple as the slot comes with a fixed coin value of $1. The only option you can adjust is the number of coins per line, per spin, which is one, two or three coins. So, your total bet can be $1, $2 or $3. 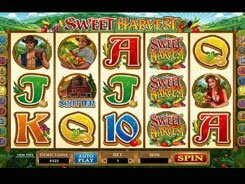 Classic and familiar to all 3-reel slot fans, the only symbols used in the game are cherries and bars (those single, double and triple). 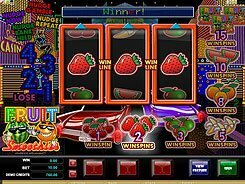 The three largest payouts of $5000, $2000 and $1000 are all awarded for hitting three Wheel of Wealth logos on the payline, with the winning amount depending on how many coins you have placed per spin. 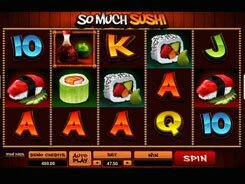 The slot features a wild represented by the slot’s logo. Along with substituting for other icons, a wild multiplies payouts by x2 or x4 when one or two logos contribute to a winning combination. There is a bonus game played on the second screen and triggered by the Spin symbol landed on reel #3. 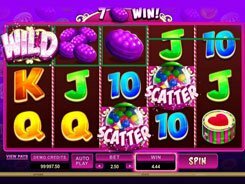 Once activated, you are taken to the second screen showing a wheel of fortune that awards various cash prizes of up to x1000 times a bet.